Steve’s breakdown: Ultra-Luxury brand are pairing up to offer one-time deals and we are sure these companies would love to hear your ideas for the next grand coupling. Make this an agency marketing campaign and just keep pitching idea after idea to company after company! EVERYWHERE, USE: Brand power couples are having a moment. Note the recent social media storm when Louis Vuitton announced a collaboration with cult streetwear brand Supreme. Witness the snaking queues every time a new Kate Moss collection arrives at Topshop. And see how skincare brand La Prairie got in on the action at Art Basel earlier this year by partnering up with international artists. A recent report by luxury alliance Walpole found that 78 per cent of brands were intending to collaborate in some way by 2020. Happily, for bigger ticket buyers, all of this power coupling isn’t restricted to handbags, hot pants and face cream. Look out to the Med this summer and you’ll likely spy more evidence of this growing trend out there on the water, as shipbuilders and carmakers wake up to the power of the partnership. Stewart Campbell, editor of superyachting authority Boat International, itself a Walpole member, understands why such partnerships could have potential. “It’s perhaps not totally natural, but there are plenty of synergies. Both worlds have to constantly innovate to incorporate new technologies and attract new audiences,” he says. “Introducing a whole lot of outside creativitycan only help push the boundaries of what’s possible, resulting in more choice and innovation for the consumer. The Aerobat 6 by Claydon Reeves is inspired by Rolls-Royce technology. AM37, unveiled at last year’s Monaco Yacht Show, is a striking example of what happens when marine and motor worlds collide. The result of a partnership between Quintessence Yachts and Aston Martin, the AM37 is a Bond-worthy powerboat, capable of reaching 50 knots. With design elements such as the sleek wraparound windscreen – referencing Aston Martin’s DNA – it has been a huge hit, with rumours of further models on the way. Porsche, who worked with Monégasque yacht builder Dynamiq to create the 35-metre GTT 115, no doubt recognised similar opportunities. 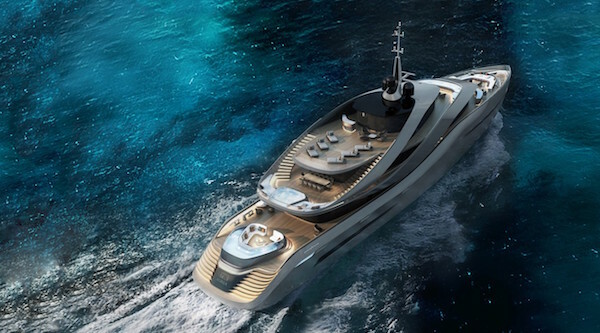 Launching at this year’s Monaco Yacht Show, the yacht (of which there will only be seven) will be sold at over 11 million euros (HK$98.4 million) a pop, but owners will be able to enjoy speeds of up to 21 knots, along with a range that enables Atlantic crossings. It’s certainly a formula that many are keen to perfect. Italian shipbuilder Rossinavi released its new yacht Aurea at London’s SuperYacht Gallery in June, created with Pininfarina, which is famed for being the go-to designers for Ferrari. The Aurea is a 70-metre superyacht, complete with two outdoor swimming pools, the largest beach club of any yacht of this size – and crucially, sweeping lines that share DNA with more than 100 Pininfarina-designed Ferraris. “Pininfarina has a history of designing racing cars, in which they have to combine elegance and sophistication with an aerodynamic profile. We were able to use this methodology to fully integrate functional requirements, like the helipad, within the design of the boat,” says Federico Rossi, the shipyard’s chief operating officer. While the customer benefits from all of this improved design and innovation, there’s yet another advantage born out of familiarity. Yacht brands stay relatively under the radar, but car brands are in the public realm. Designing a yacht in conjunction with a household name pins a recognisable label onto what can be an intimidating product. For now, it seems these partnerships are filled with promise. However, the customer is in the driving seat now.